I spent the morning on guided tours of Cliff Palace and Balcony House, two of the cliff dweller remains. Each tour costs $3. Entrance into the park is $15. A campsite is $20. If you add all that up, you might be able to buy a hotdog at Disneyland. Mesa Verde is one of our national parks (“the greatest idea that American ever produced”), and like many of these parks, the infrastructure (such as, the steps dug into the mountain side that lead down to the cliff houses and back up to the mesa) was built by the Civilian Conservation Corps (CCC), a federal jobs program created during the Great Depression. The CCC used federal money to build parks, bridges, and buildings for public use. For all Americans, not just the rich. The national parks are quintessentially democratic. I hardly know what to say about the cliff houses. They were built 800-900 years ago, and large portions of the structures are still standing. My boyhood home was built in 1956 (abandoned long ago by my family), and it is already falling apart. I would much rather spend a night in a cliff house than in my boyhood home. The cliff houses are about a hundred feet below the mesa and often a thousand feet above the floor of a canyon. 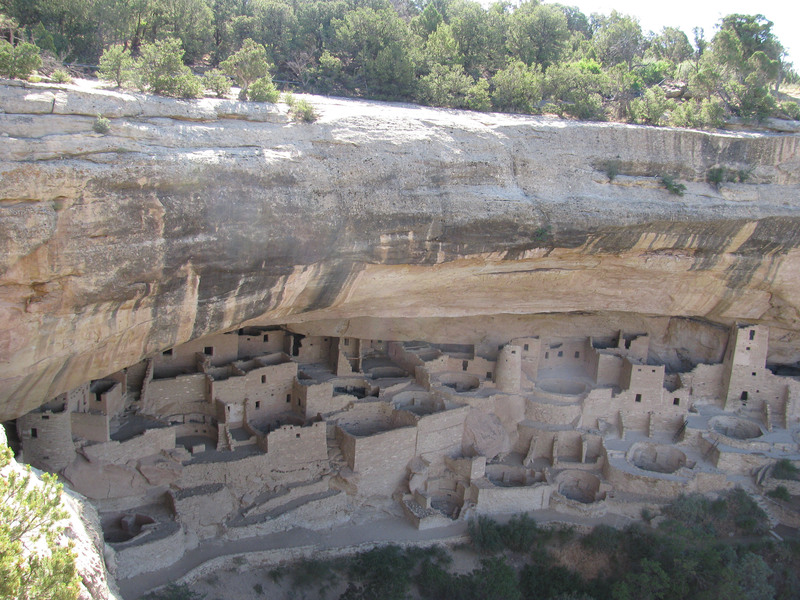 The Ancient Puebloans climbed down to the cliff houses, often carrying supplies, through a series of toe holes. The Cliff Palace has over a hundred rooms and probably served as a religious and commercial center. The Balcony House, more typical in size, has about twelve rooms. To move through the structure, you have to traverse a few tunnels, probably built to defend the residents as resources grew scarce. The Ancient Puebloan men were about 5’4”. I could hardly squeeze my six foot frame through the narrow passages. One of the mysteries of the cliff houses is why their residents left so abruptly. The houses were abandoned as if the residents planned to return; they left baskets, pots, and tools. Most archeologists think that the resources of the area grew more scarce as the population grew to around 30,000 to 40,000 in the four corners area (a population about twice that of today). A twenty-three year drought was the final blow. Their civilization was simply not sustainable. Have you ever read Joel Bakan’s “The Corporation”? In it he talks about how certain folks @ The Cato Institute want the NPS privatized. He even interviewed one of their senior fellows who felt that every square foot of land on earth ought to be privately owned. I hope that never happens. But then again, I don’t think Americans would have it. I haven’t read that book. However, as I was driving across Colorado yesterday, I passed three different national forests, each amazingly beautiful. Out west, much of the land is own by the national government, well, by owned by us and managed by the governmnet. The idea of holding this in the national trust was to manage it wisely. In the early days of the Bush administration (I am going to try to avoid wedge issues on this blog, but some issues are too important to ignore), Cheney held a meeting with oil executives at the White House. Reporters tried to find out what was discussed, but the White House claimed executive privilege. Now, we are starting to understand what was probably discussed. The oil executives probably told Cheney which federal regulations they would like relaxed or overturned. We have always had some ranching and mining on public lands, but now we have massive drilling for natural gas that is poluting the ground water. In the recently released documentary GASLAND, in one scene, a guy turns on the water in his kitchen sink and holds a match to it. Flames shoot up about three feet. I agree, Caleb, that we need to keep these lands in the public trust, but that means we (the public) have to be actively involved in that trust. Also, when I was watching the Ken Burns documentary about our National Parks, I was surprised at how close these resources came to being destroyed in a single generation. I think any American who has been in touch with our National Parks or National Forests would want to keep them public, but we all have to be involved with protecting them. Thanks for your comment.